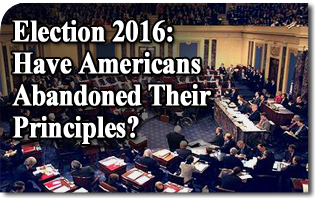 The American TFP > News Commentary > Election 2016: Have Americans Abandoned Their Principles? Election 2016: Have Americans Abandoned Their Principles? America is in crisis, and most people don’t know what to do about it. They are frustrated by a lack of direction and purpose. They are wary of established systems and political maneuvers. They don’t care how the problem is resolved but only that it be resolved. Across the nation, many are asking: What’s the solution? Perhaps this question is part of the problem. People are looking for a solution—a single solution to a multitude of problems. They want a new system to replace old systems they don’t trust anymore. Under a single banner, they want to unite a polarized people who can’t even agree on the proper use of a public bathroom. It is a time of savior politics to find the one who can find a way—any single way—to get things done, and get them done quickly. Such an outlook is a doomed proposition since it will never lead to unity. Under these conditions, the single solution will always be an imposed solution since it is sure to alienate some portion of the population. It also assures the victory of the liberals. In a climate where all are clamoring for a single solution, liberals have a definite advantage. By nature and definition, the liberal is one who creates single solutions before addressing the problems. The liberal comes up with one-size-fits-all government programs financed with other people’s money that leave nothing to chance. Their programs are full of mandates that must solve all problems and violate all consciences. If health care is a problem, for example, the liberal solution is to write a 900-page omnibus law with 155,000 codes to take care of every possible illness under a single system. If education is a problem, a total solution must be found by imposing a universal curriculum with intensive testing integrating all children into a kindergarten-through-college national database to track success. If bathroom use is a problem, simply allow everyone to use the same bathrooms and threaten to withhold federal education funds from any state that dare resist. There is no problem so complex that it cannot be overcome by a single liberal solution backed up by judicial fiat, executive order, or legislative politicking. There are no obstacles so great that cannot be toppled by politicians intent upon pushing through such agendas. There is nothing more terrible than the wrath of a liberal whose well-intentioned total solution has been rejected. Single solutions open the dangerous doors to tyranny. Meanwhile, faced with the desperate search for single solutions, conservatives are definitely at a disadvantage. They seem to lack imagination. The liberal establishment loves to paint the conservative solution as a nostalgic vision of the past that, when restored, will solve all problems. The reality is quite different. By nature and definition, conservatives cannot compete with single solutions simply because they do not believe in them. True imaginative conservatives prefer to address the problems, before they address the solution. They embrace organic not artificial solutions. According to this truly conservative vision, policy should be based on the organic nature of things. Thus, the most important step is to establish a core of guiding principles based upon this nature, which then allows people to make their own decisions and find their own solutions, in great personal freedom. There is no single conservative solution, but rather many solutions informed by a few basic principles and rules. Once it is agreed upon what constitutes the basis of a good education, for example, the conservative leaves it to parents and the local school district to come up with solutions suited to their local circumstances. That is why conservatives always support good morals and family life, since they know this creates a climate that allows those in society to find ways to prosper. Such innovative solutions have always been embedded in the American way of life. Because people are naturally so different, a society of organic solutions is full of richness and variety. Organic solutions define a few rules from which come thousands of refreshing systems of doing things. The liberal solution imposes a single system from which come a thousand rules and regulations. The conservative creates conditions for people to solve their own problems. The liberal creates a single program for people to perpetuate them. The problem with the present election cycle is that principles have been abandoned. The left is arguing programs, not principles. And conservatives are now caving in on principles in the mistaken belief that their own versions of single solutions and promises might be the way to garner votes from a desperate electorate. This impoverished approach is the shortcut to ruin. As seen on The Imaginative Conservative.